Coordination complexes are so pervasive that their structures and reactions are described in many ways, sometimes confusingly. 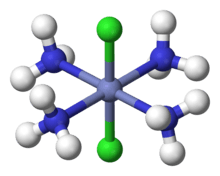 The atom within a ligand that is bonded to the central metal atom or ion is called the donor atom. In a typical complex, a metal ion is bonded to several donor atoms, which can be the same or different. A polydentate (multiple bonded) ligand is a molecule or ion that bonds to the central atom through several of the ligand's atoms; ligands with 2, 3, 4 or even 6 bonds to the central atom are common. These complexes are called chelate complexes, the formation of such complexes is called chelation, complexation, and coordination. The central atom or ion, together with all ligands comprise the coordination sphere. The central atoms or ion and the donor atoms comprise the first coordination sphere. 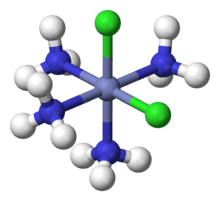 2is 4 (rather than 2) since it has two bidentate ligands, which contain four donor atoms in total. Following this theory, Danish scientist Sophus Mads Jorgensen made improvements to it. In his version of the theory, Jorgensen claimed that when a molecule dissociates in a solution there were two possible outcomes: the ions would bind via the ammonia chains Blomstrand had described or the ions would bind directly to the metal. Typically the chemistry of transition metal complexes is dominated by interactions between s and p molecular orbitals of the ligands and the d orbitals of the metal ions. The s, p, and d orbitals of the metal can accommodate 18 electrons (see 18-Electron rule). The maximum coordination number for a certain metal is thus related to the electronic configuration of the metal ion (to be more specific, the number of empty orbitals) and to the ratio of the size of the ligands and the metal ion. Large metals and small ligands lead to high coordination numbers, e.g. [Mo(CN)8]4−. Small metals with large ligands lead to low coordination numbers, e.g. Pt[P(CMe3)]2. Due to their large size, lanthanides, actinides, and early transition metals tend to have high coordination numbers. Different ligand structural arrangements result from the coordination number. Most structures follow the points-on-a-sphere pattern (or, as if the central atom were in the middle of a polyhedron where the corners of that shape are the locations of the ligands), where orbital overlap (between ligand and metal orbitals) and ligand-ligand repulsions tend to lead to certain regular geometries. The most observed geometries are listed below. There are cases that deviate from a regular geometry due to the use of ligands of different types (which results in irregular bond lengths) or due to the size of ligands. Tri-capped trigonal prismatic (triaugmented triangular prism) or capped square antiprismatic for nine-coordination. Due to special electronic effects such as (second-order) Jahn–Teller stabilization, certain geometries (in which the coordination atoms do not follow a points-on-a-sphere pattern) are stabilized relative to the other possibilities , e.g. for some compounds the trigonal prismatic geometry is stabilized relative to octahedral structures for six-coordination. Optical isomerism occurs when a molecule is not superimposable with its mirror image. It is so called because the two isomers are each optically active, that is, they rotate the plane of polarized light in opposite directions. 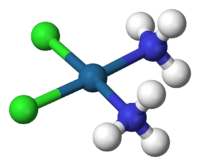 The symbol Λ (lambda) is used as a prefix to describe the left-handed propeller twist formed by three bidentate ligands, as shown. Likewise, the symbol Δ (delta) is used as a prefix for the right-handed propeller twist. Ionisation isomerism – the isomers give different ions in solution although they have the same composition. This type of isomerism occurs when the counter ion of the complex is also a potential ligand. For example pentaamminebromocobalt(III) sulfate [Co(NH3)5Br]SO4 is red violet and in solution gives a precipitate with barium chloride, confirming the presence of sulfate ion, while pentaamminesulfatecobalt(III) bromide [Co(NH3)5SO4]Br is red and tests negative for sulfate ion in solution, but instead gives a precipitate of AgBr with silver nitrate. Solvate or hydrate isomerism – the isomers have the same composition but differ with respect to the number of solvent ligand molecules as well as the counter ion in the crystal lattice. For example [Cr(H2O)6]Cl3 is violet colored, [CrCl(H2O)5]Cl2·H2O is blue-green, and [CrCl2(H2O)4]Cl·2H2O is dark green. Coordination isomerism – this occurs when both positive and negative ions of a salt are complex ions and the two isomers differ in the distribution of ligands between the cation and the anion. For example [Co(NH3)6][Cr(CN)6] and [Cr(NH3)6][Co(CN)6]. Transition metal complexes often have spectacular colors caused by electronic transitions by the absorption of light. For this reason they are often applied as pigments. Most transitions that are related to colored metal complexes are either d–d transitions or charge transfer bands. In a d–d transition, an electron in a d orbital on the metal is excited by a photon to another d orbital of higher energy. A charge transfer band entails promotion of an electron from a metal-based orbital into an empty ligand-based orbital (Metal-to-Ligand Charge Transfer or MLCT). The converse also occurs: excitation of an electron in a ligand-based orbital into an empty metal-based orbital (Ligand to Metal Charge Transfer or LMCT). These phenomena can be observed with the aid of electronic spectroscopy; also known as UV-Vis. For simple compounds with high symmetry, the d–d transitions can be assigned using Tanabe–Sugano diagrams. These assignments are gaining increased support with computational chemistry. Superficially lanthanide complexes are similar to those of the transition metals in that some are coloured. However for the common Ln3+ ions (Ln = lanthanide) the colors are all pale, and hardly influenced by the nature of the ligand. The colors are due to 4f electron transitions. As the 4f orbitals in lanthanides are “buried” in the xenon core and shielded from the ligand by the 5s and 5p orbitals they are therefore not influenced by the ligands to any great extent leading to a much smaller crystal field splitting than in the transition metals. The absorption spectra of an Ln3+ ion approximates to that of the free ion where the electronic states are described by spin-orbit coupling (also called L-S coupling or Russell-Saunders coupling). This contrasts to the transition metals where the ground state is split by the crystal field. Absorptions for Ln3+ are weak as electric dipole transitions are parity forbidden (Laporte Rule forbidden) but can gain intensity due to the effect of a low-symmetry ligand field or mixing with higher electronic states (e.g. d orbitals). Also absorption bands are extremely sharp which contrasts with those observed for transition metals which generally have broad bands. This can lead to extremely unusual effects, such as significant color changes under different forms of lighting. Formation constants vary widely. Large values indicate that the metal has high affinity for the ligand, provided the system is at equilibrium. In these reactions which both occurred in the same reaction vessel, the solubility of the silver chloride would be increased as a result of the formation of the complex ion. The complex ion formation is favorable takes away a significant portion of the silver ions in solution, as a result the equilibrium for the formation of silver ions from silver chloride will shift to the right to make up for the deficit. This new solubility can be calculated given the values of Kf and Ksp for the original reactions. The solubility is found essentially by combining the two separate equilibria into one combined equilibrium reaction and this combined reaction is the one that determines the new solubility. So Kc, the new solubility constant, is denoted by Kc = Ksp * Kf. Metals only exist in solution as coordination complexes, it follows then that this class of compounds are useful. Coordination compounds are found both in the natural world and artificially in industry. Some common complex ions include such substances as vitamin B12 , hemoglobin , chlorophyll, and some dyes and pigments. One major use of coordination compounds is in homogeneous catalysis for the production of organic substances. Coordination compounds have uses in both nature and in industry. Coordination compounds are vital to many living organisms. For example many enzymes are metal complexes, like carboxypeptidase, a hydrolytic enzyme important in digestion. This enzyme consists of a zinc ion surrounded by many amino acid residues. Another complex ion enzyme is catalase, which decomposes the cell waste hydrogen peroxide. This enzyme contains iron-porphyrin complexes, similar to that in hemoglobin. Chlorophyll contains a magnesium-porphyrin complexes, and vitamin B12 is a complex with cobalt and corrin. Coordination compounds are also widely used in industry. The intense colors of many compounds render them of great use as dyes and pigments. Specifically Phthalocyanine complexes are an important class of dyes for fabrics. Nickel, cobalt, and copper can be extracted using hydrometallurgical processes involving complex ions. They are extracted from their ores as ammine complexes with aqueous ammonia. Metals can also be separated using the selective precipitation and solubility of complex ions, as explained in later sections. Cyanide complexes are often used in electroplating. Coordination compounds can also be used to identify unknown substances in a solution. This analysis can be done by utilizing the selective precipitation of the complex ions, the formation of color complexes which can be measured spectrophotometrically, or the preparation of complexes, such as metal acetylacetonates, which can be separated with organic solvents. A combination of titanium trichloride and triethylaluminum brings about the polymerization of organic compounds with carbon-carbon double bonds to form polymers of high molecular weight and ordered structures. Many of these polymers are of great commercial importance because they are used in common fibers, films, and plastics. They are used in photography, i.e., AgBr forms a soluble complex with sodium thiosulfate in photography. K[Ag(CN)2] is used forelectroplating of silver, and K[Au(CN)2] is used for gold plating. 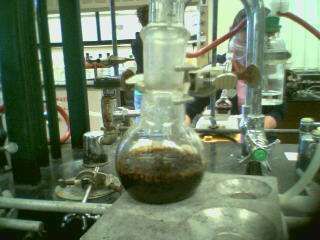 Some ligands oxidise Co2+ to Co3+ ion. Ethylenediaminetetraacetic acid (EDTA) is used for estimation of Ca2+ and Mg2+ in hard water. ↑ IUPAC, Compendium of Chemical Terminology, 2nd ed. (the "Gold Book") (1997). Online corrected version: (2006–) "complex". ↑ IUPAC, Compendium of Chemical Terminology, 2nd ed. (the "Gold Book") (1997). Online corrected version: (2006–) "coordination entity". ↑ Cotton, Frank Albert; Geoffrey Wilkinson; Carlos A. Murillo (1999). Advanced Inorganic Chemistry. p. 1355. ISBN 978-0-471-19957-1. ↑ Miessler, Gary L.; Donald Arthur Tarr (1999). Inorganic Chemistry. p. 642. ISBN 978-0-13-841891-5. ↑ Kaupp, Martin (2001). ""Non-VSEPR" Structures and Bonding in d0 Systems". Angew. Chem. Int. Ed. Engl. 40 (1): 3534–3565. doi:10.1002/1521-3773(20011001)40:19<3534::AID-ANIE3534>3.0.CO;2-#. ↑ Miessler, Gary L.; Donald Arthur Tarr (1999). "9". Inorganic Chemistry. pp. 315, 316. ISBN 978-0-13-841891-5. ↑ Cotton, Simon (2006). Lanthanide and Actinide Chemistry. John Wiley & Sons Ltd.
↑ Stretton, Tom. "Solubility and Complex-ion Equilibria" (PDF).